When it comes to your workouts, high-intensity interval training packs virtually endless benefits. From cardiovascular conditioning to maximum fat burning, HIIT offers results that leave old-school steady-state cardio workouts in the dust. HIIT workouts alternate periods of high-intensity exercise with lower-intensity exercise as recovery, boosting your overall fat burn as well as energy output. Besides their fitness and weight-loss benefits, you can use a number of training methods when doing HIIT workouts – bodyweight exercises, sprinting, kettlebells, barbells, and more. 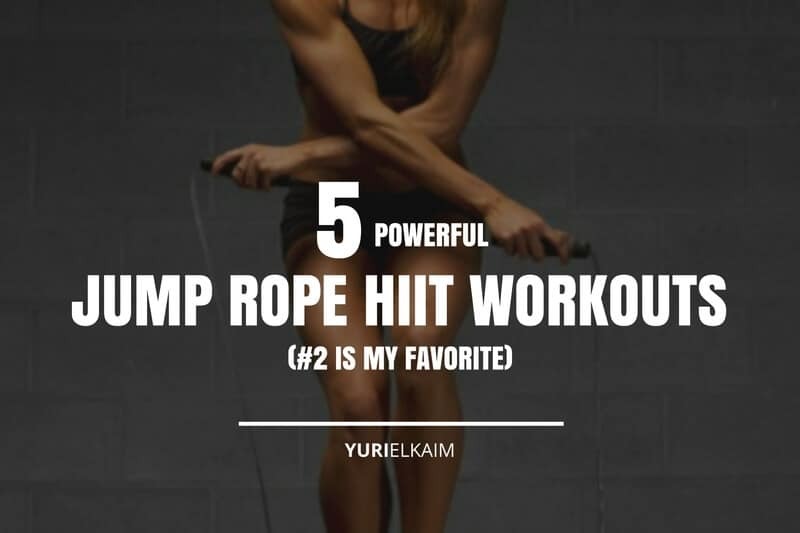 But one of the best methods to get in a fast, efficient workout is to use jump rope for your HIIT routine. And while running is a popular choice when it comes to HIIT workouts, there are several reasons to pick up a jump rope instead. Jumping rope is an intense full-body exercise. The leg muscles work to help us jump, the core engages to keep us balanced, and the arms work to rotate the rope. Why do we care about intensity? Because it’s an important factor in burning fat and increasing metabolic output, not only during our workout, but also afterward. It’s also why conventional, steady-state cardio is less effective when it comes to building muscle and lose fat. HIIT can burn three times as much fat as steady-state cardio, according to a study from the University of New South Wales Medical Science. Researchers had one group do 8-second bike sprints followed by 12 seconds of rest for a total of 20 minutes, while another group pedaled at a steady pace for 40 minutes. The sprinters lost 2.5 kg of subcutaneous fat, while the other group showed no loss of fat (1). Not only that, but HIIT workouts also increase growth hormone levels. Growth hormone helps to build muscle and also is key to catecholamine (adrenaline, norepinephrine) release, which increases fatty acid mobilization (2). Not to mention, engaging more muscles during a HIIT workout greatly increases the amount of calories burned after the workout. This is known as excess post-exercise oxygen consumption, or EPOC, and is the amount of energy we use (or calories we burn) following a workout, rather than during. Put simply, EPOC is the result of your body using energy to restore your oxygen levels, clear out excess lactic acid, and repair your muscles – all of which increase post-exercise calorie burn, or EPOC. Interestingly, EPOC is higher after shorter, higher-intensity workouts (think under 30 minutes) than after longer, steady-state “chronic cardio” style workouts. In fact, studies have shown metabolic improvement during high-intensity workouts (like jumping rope) lasting no longer than seven minutes (3). This is where jump rope workouts excel, as they’re short and challenging. The problem with using a treadmill to do HIIT workouts is that there is always a lag period when increasing and decreasing the speed. When you jump rope, this isn’t an issue, as you’re able to increase your jump speed and intensity almost instantaneously. While running can be a great calorie-torching method, it’s also rough on our joints and ligaments, especially when done without proper form. Specifically, some runners have a tendency to land on their heels while running. This takes the impact off the leg muscles and onto the joints and bones, causing undue stress. Making matters worse, runners often run for long distances several times a week, which can turn these simple form mistakes like heel strikes into injuries. Jumping rope, on the other hand, essentially forces correct form. For instance, if you land on your heel while jump roping, you’re going to be in a world of pain, so you’ll quickly teach yourself to land on the balls of your feet. Not to mention, the fact that you have to keep your back straight and core engaged ensures that any force generated by jumping is being absorbed by the muscles of the calves, legs, and core instead of the joints. Now, before we get into some of these workouts, lets take a look at proper form. Proper form while jumping rope will stem from having a good rope. Know that plastic “speed” ropes are easier to handle and circle faster than their cotton alternatives. Once you’ve selected a rope, be sure it’s adjusted to your height. When you stand on the middle of the rope, the handles should reach your arm pits. Wrap your hand around the rope if you need to. Also, always keep your elbows slightly bent while jumping, with your hands at hip height and arms close to your sides. Land on the balls of your feet, keeping your feet close to the ground when you jump. The following workouts are quick and efficient, needing only a rope, an interval timer (or app), and a stability ball. Since HIIT is so intense, it’s best to do these workouts only 2-3 times per week in addition to your strength training routine. 30 seconds all-out jumping – try to perform as many reps as possible. Repeat circuit 5 to 10 times. This circuit integrates core movements for an effective ab-sculpting, fat-burning HIIT. Repeat this circuit 2 to 3 times through. For a more advanced routine, decrease the amount of rest between sets. This jump rope HIIT workout combines full-body sculpting moves with all-out skipping. Repeat this circuit 4 to 10 times through. Advanced levels can remove the rest period altogether, or try substituting double unders for regular jumping. To do a double under, you want to jump high enough so that the rope swings twice beneath your feet with each jump. Keep in mind to avoid windmilling your arms as you try to swing the rope faster. Instead, swing your rope with your wrists while jumping higher than normal. Don’t worry if it takes a while to master this technique as double unders are a challenging variation for even the most conditioned athletes. This routine involves alternating jumping methods with periods of slow jumping for an intense cardio workout. This routine combines advanced jump rope techniques with upper body sculpting moves. For beginners, replace the foot-cross and double-under with standard jumping or high knees. Repeat this routine three times through. Jump rope HIIT cardio is one of the best forms of HIIT you can do. It torches calories, puts less pressure on your joints, and burns fat like no other. In other words, it’s time to say goodbye to lengthy, boring treadmill workouts and hop (yes, pun intended!) on the jump rope bandwagon. Want even more? Get the ultimate follow-along interval cardio workout to burn more fat and improve your cardio endurance in just 5 minutes. My Speed Burst Interval Workout is a $19 value – but you can get it right now for FREE. Just click the banner below for an instant download!